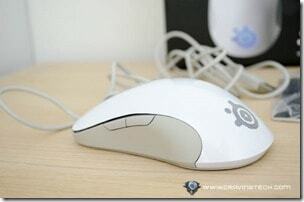 SteelSeries Sensei [RAW] Frost Blue Edition review – SteelSeries Sensei is my most favorite mouse from SteelSeries. 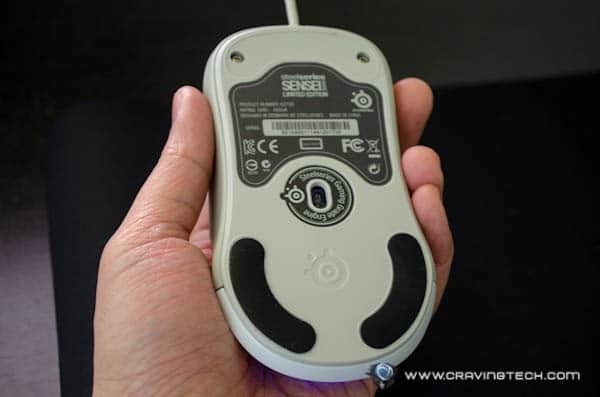 Saying that, I still love their previous Xai and Ikari that I reviewed years ago, but the Sensei looks very sleek and accurate to use in online competitive FPS games such as CounterStrike (yes, people still play CounterStrike, mind you). 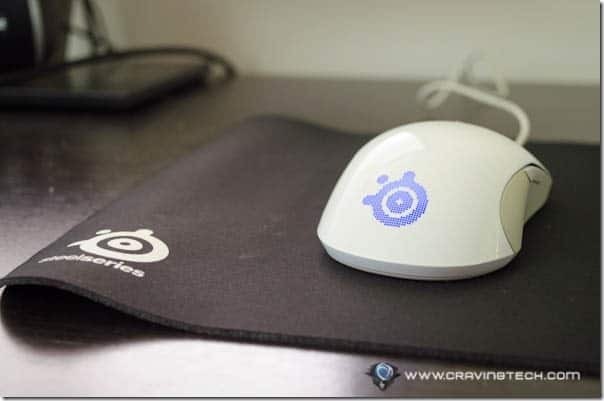 Note that the SteelSeries Sensei [RAW] Frost Blue edition is a limited edition mouse. So I’m really blessed to be able to get a hold of the review sample. 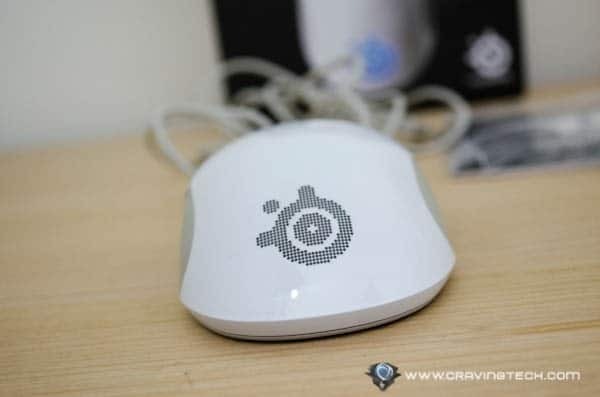 SteelSeries Sensei [RAW] can be seen as a “cut-down” version from the original SteelSeries Sensei. Think of it as a more affordable Sensei with just the things you need minus the bling-bling that you may not want from the original, pricier, Sensei. 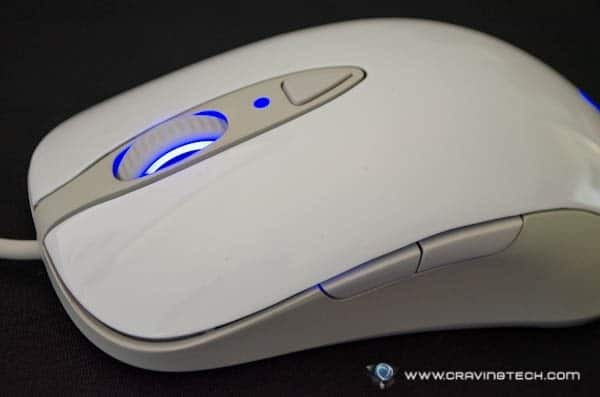 For example, you probably won’t care if you can’t change the illumination color to pink or have an info LCD beneath the mouse. The packaging is simple and minimalist. The Frost Blue edition is a glossy Sensei [RAW] version, coated in white (oh, yeah). It looks sleeker compared to the Black-colored version (in my opinion) and the “frosty” blue illumination takes it even further. 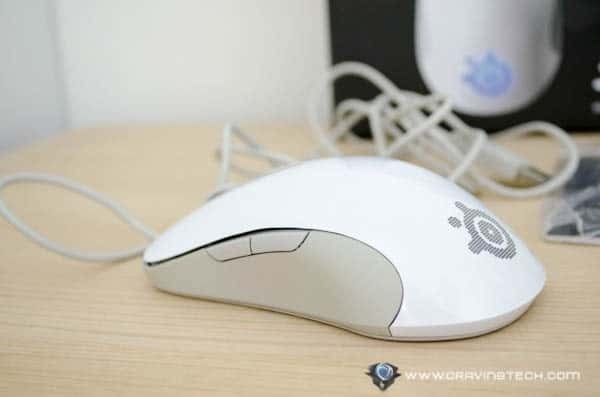 The combination of both colors matches the whole theme of the mouse really well. Frosty! 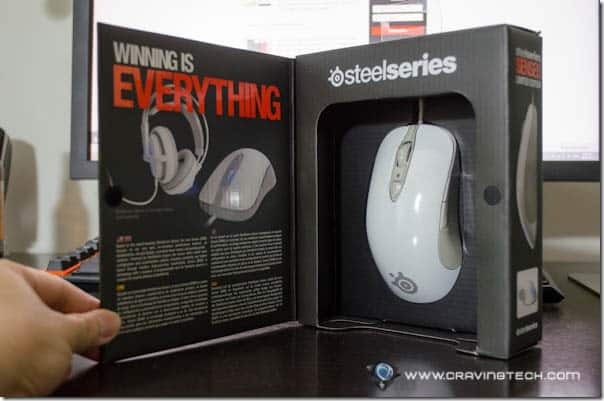 It also goes well with The Siberia v2 Frost Blue Edition – which I’ll be reviewing in a separate post soon. 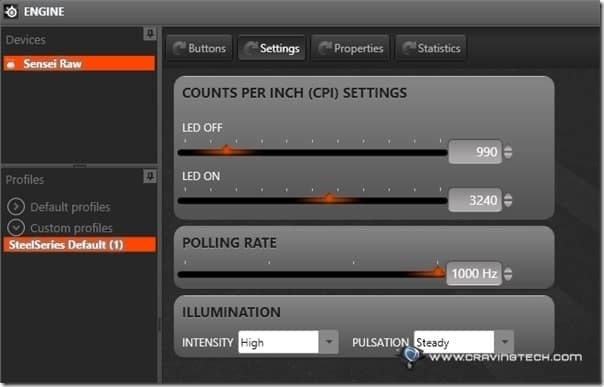 With the help of SteelSeries Engine software, you can further customise the illumination intensity (low, medium, or high) and pulsation levels. The color will always be blue in the Frost Blue edition (doh?) but if you want to go all out with a 16.8 million color choice, pick the original Sensei instead. The glossy surface feels slippery at first but once you grip it, it’s actually pretty tight and solid. Your fingers will stay still on the buttons (unless if you were eating chips earlier and had your hands unwashed). The Sensei [RAW] Frost Blue Edition is ambidextrous and also equipped with 2 side buttons on each side, plus a dedicated CPI switch below the middle button. You can only store 2 CPI levels per profile – which may or may not be enough for some. I was expecting the [RAW] edition to be ordinary. Or at least, not on par with the original Sensei. I was wrong, thankfully. Though the grip feels different (due to the glossy surface), everything else feels the same. The mouse size is perfect for my small hands and it glides smoothly on the SteelSeries QCK mouse pad. I tested the mouse with games of different genre and it rocked. In an MMORPG setting (Final Fantasy XXIV), the lightweight design helps in keeping the mouse rolling – without making my hands tired for hours (having to continuously click for targets, dialogues, and for strafing during combat). 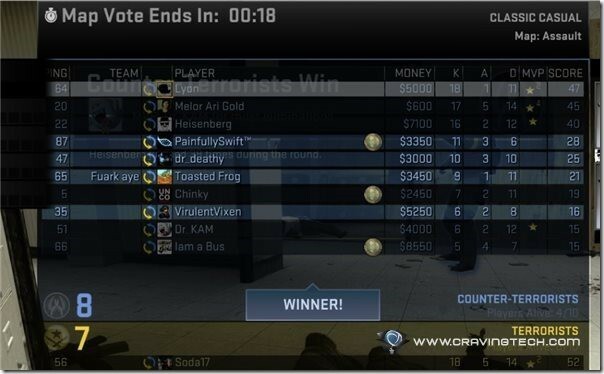 In an FPS setting (CounterStrike:Global Offensive), the laser sensor is accurate and reliable. I never had moments where I could blame my mouse for getting killed (should have put this as a cons, actually, because I don’t have an excuse anymore for getting owned). The tactile feedback of the button is perfect for unleashing the Five-Seven pistol rounds quickly. 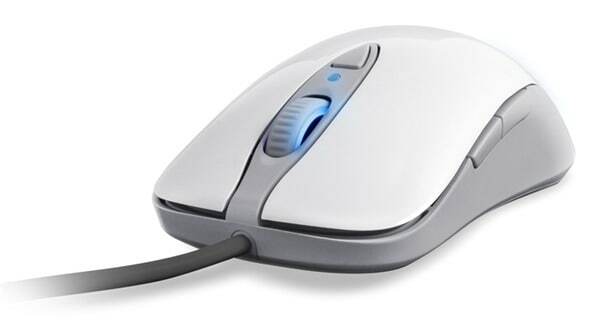 The mouse definitely helps you to win by complementing your skill. 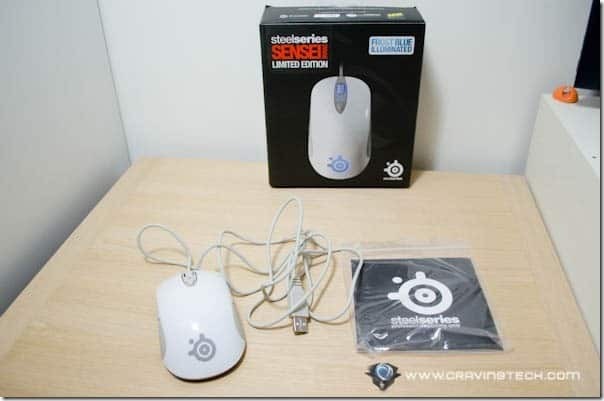 Compared to the original Sensei, the SteelSeries Sensei [RAW] Frost Blue Edition feels cheap with its glossy surface and non-braided rubber cord. However, it conveys an elegant design with its white color and blue illumination. Not to mention that it is cheaper than the full blown Sensei. Sensei [RAW] Frost Blue Edition is a solid mouse to grip despite of the glossy surface and gives a sturdy, accurate glide. The mouse handling is superb and delivers enjoyable gaming experience. Your cursor goes where it should go and there is no awkward jerky movement. If you don’t need all the bells and whistles that the original Sensei has, the Sensei [RAW] (Frost Blue Edition or not) will keep you happy for many months to come.